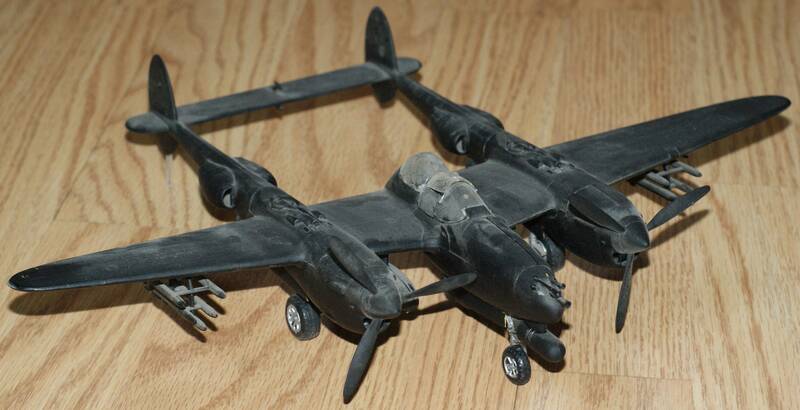 Thirty or so years ago I built this model of a P-38J. Since then it's languished in my parents basement and is completely covered with dirt. I tried to use compressed air to blow it off and it didn't work very well. Does anybody have suggestions on how to clean it off? I'm hesitant to immerse it in water since I think I glued the canopy on with ordinary white glue. Try a clean dry paint brush. Q-tips and regular rubbing alcohol. I'd suspect theres some oil and grime holding all that dust in place. Alcohol will cut through it. Seconding swabs filled in rubbing alcohol, but be sure to test on a section first to ensure it doesn't cause discoloration. Also, follow with distilled water. Try the swabs dipped in distilled water first, actually. Conservators who clean oil paintings swear by using Q-tips dipped in spit (well, you sort of twirl the Q-tip in your mouth to wet it, and then wipe with it). Your mileage may vary. Just don't double-dip any Q-tips, if you know what I mean. Water ought to work pretty well, although I agree that you shouldn't immerse it. White glue, once dried, won't suffer if you use a small amount of water. I'd probably go with a slightly damp sponge - it won't leave any residue. I'd be concerned that alcohol might take some of the paint off, although that shouldn't happen if it's enamel. If you use water, try warm (or hot) soapy water. That will dramatically cut the exposure time. Goo-Gone (tm) can also work wonders at removing old crud; of course you should carefully spot-test it first. I had tried the clean brush and it didn't work any better than the canned air. I just tried the alcohol and q-tip. It takes quite a bit of rubbing to get the dirt off and the q-tip is much blacker than I expected. I also noticed a small bump that had its paint rubbed off so I'm afraid it's taking paint off. I think I'll try warm soapy water next and be ready to reattach the canopy. I'm not sure I really want a thin layer of dried spit on it. Warm soapy water will work. The soapy water worked like a charm. The canopy was held on with white glue so I was extremely gentle with it and managed to make it much better. Pic of final product. Thanks.